I recently did a presentation at the Cloud Austin meetup titled Docking with Unicorns about new PAAS on the block DEIS. Building out DEIS is quite easy, make more easy by some tight integration they have with Rackspace Cloud. If you’re interested in what deis is go through my slides linked above, and the documentation on their website. If you want to build out an environment to kick the tires a bit, then click ‘Read on’ below and follow me down the rabbit hole. Chef offers a free hosted service for up to five servers. That’s plenty for this exercise so go to the registration page and create yourself a user. At some point it will prompt you to generate and save a key, do that and download it. 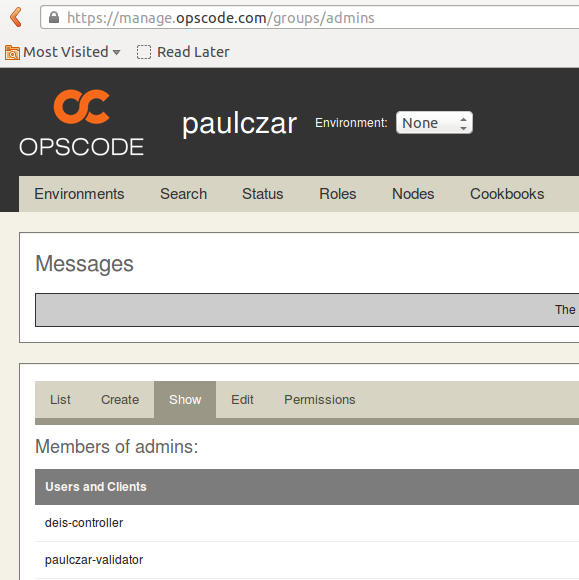 Once you have signed up you can download a knife config file and generate a validation key from the Organizations page. We can save those down and then move them to a local working directory. remote: Reusing existing pack: 5651, done. Receiving objects: 100% (5651/5651), 2.16 MiB | 1.37 MiB/s, done. Resolving deltas: 100% (3131/3131), done. Deis is currently hardcoded to use the _default chef environment. There is a current issue on their github to resolve this. Once that is done I’ll update these instructions to create a deis environment. I’m using Rackspace cloud servers for this as I have the (http://developer.rackspace.com/blog/developer-love-welcome-to-the-rackspace-cloud-developer-discount.html)[Rackspace Developer Discount] which is enough discount to host this for free. Since Deis will want your rackspace credentials to configure worker nodes I recomment creating a user under (https://mycloud.rackspace.com/account#users/create)[User Management] in your account to use for this. 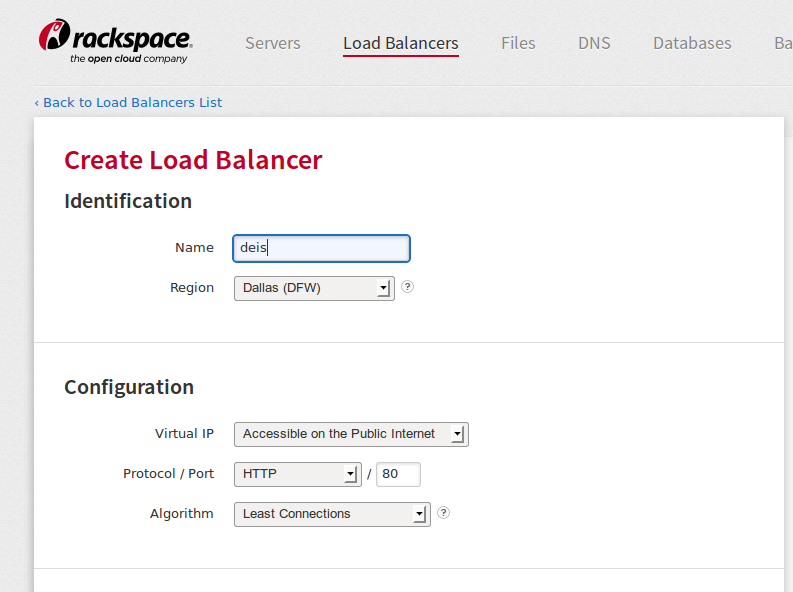 Log into mycloud.rackspace.com and click on the (https://mycloud.rackspace.com/load_balancers)[Load Balancers] button. 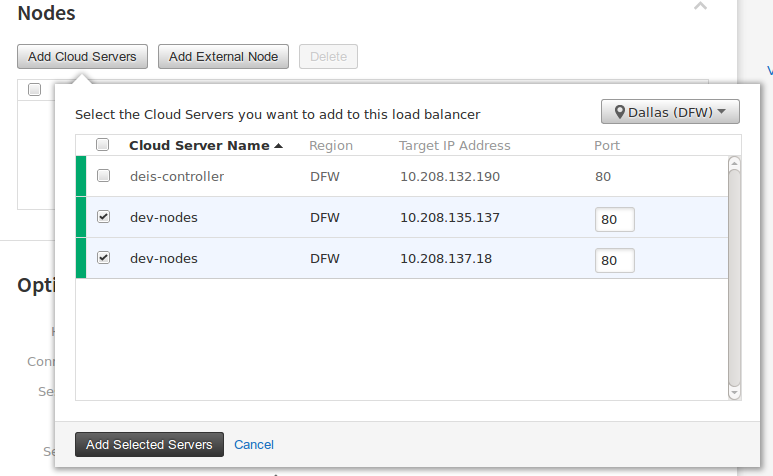 Select the Dallas Region (DFW) and hit Create Load Balancer. Take note of the public IP of the Load Balancer, we’ll need it later. 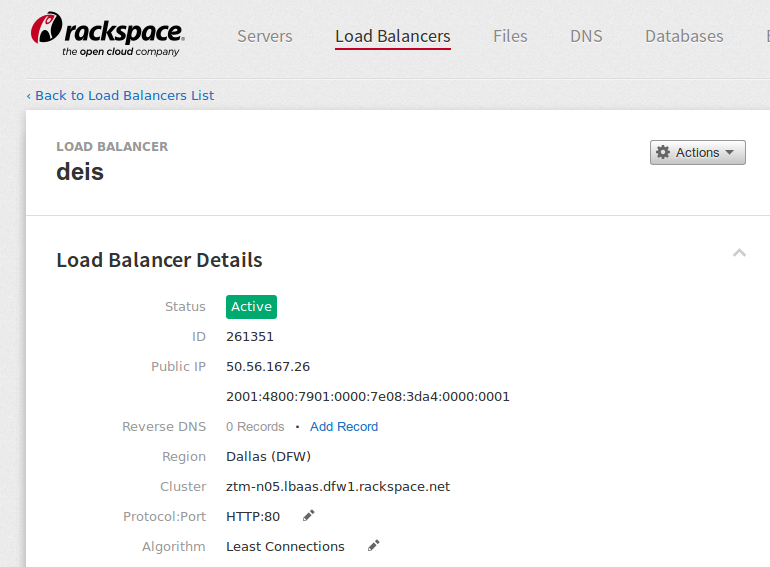 Rackspace Cloud DNS can host wildcard DNS entries, if you already have DNS hosted by rackspace using Cloud DNS simply add an A record for *.deis under your domain and point it to the IP of your load balancer. The (http://xip.io)[xip.io] domain does wildcard DNS based on your IP. We can use this with our Cloud Load Balancer to load balance our applications. My Load Balancer has a public IP of 50.56.167.26 therefore my wildcard domain will be 50.56.167.26.xip.io. Remember this. The bundle install above already installed the rackspace knife plugin so we just need to add some details to .chef/knife.rb. Build base images for Controller and Nodes. This isn’t strictly necessary, but will help build your nodes quicker on subsequent builds. Take note of the Instance ID, Public IP Address and Password. We’ll need them later. Now try logging into the machine, with:   "ssh 'root@162.242.144.193'"
Next we’re going to update the kernel and prepare the base node image. Once the image is active we can move onto the next steps. Take note of the Instance ID and Public IP Address. $ sudo sh -c "echo '<IP_OF_SERVER> deis' >> /etc/hosts"
On the Chef management website click (https://manage.opscode.com/groups/admins/edit)[Groups] and add the deis-controller client and your validator client to the admins group. [2014-02-23T19:25:33+00:00] INFO: Start handlers complete. 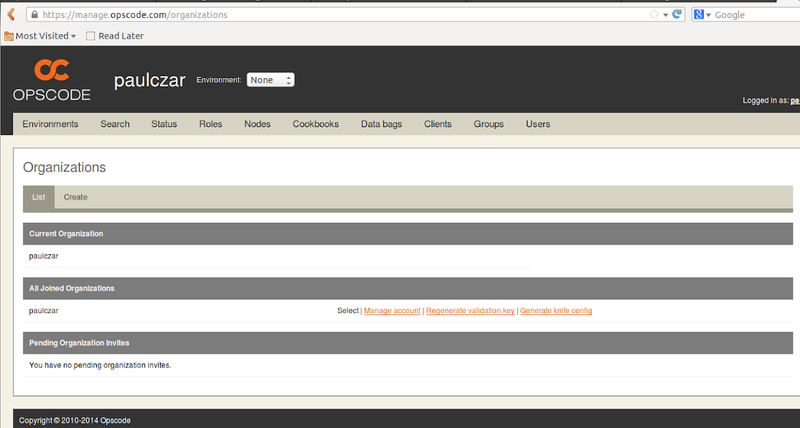 check the web server is serving content by browsing to (http://deis)[http://deis] and entering your admin credentials. Deis will automatically provision worker nodes if you teach it your credentials. Formations are collections of infrastructure for serving applications. We’ll call our first Formation dev for development. Proxy - Directs traffic to the appropriate container running the application. Runtime - Runs the containers that hold the applications. Next we tell deis to spin up two Cloud Servers which will become members of the nodes layer. Scaling nodes... but first, coffee! This can sometimes take longer than the deis cli timeout. Don’t fear, just wait a bit longer, this could be a great time to explore the deis cli by running deis help. Add these two nodes to the (https://mycloud.rackspace.com/load_balancers)[Cloud Load Balancer] we created earlier. Click on your load balancer and under Nodes click the Add Cloud Servers button. Check the box beside the two dev-nodes servers and click Add Selected Servers. So great, you have a PaaS, but what do you do now? Deploy some apps of course! Compressing objects: 100% (89/89), done. Writing objects: 100% (184/184), 28.77 KiB | 0 bytes/s, done. npm WARN package.json example-nodejs-express@0.0.1 No repository field. Open your web browser to the URL in the output of the previous command. In my case this was http://exotic-sandwich.50.56.167.26.xip.io. If everything worked the text in the browser window should read Powered by Deis. Scaling containers... but first, coffee! Congratulations! You’ve successfully built out your own cost effective PAAS and deployed your first application to it. Speaking of costs … How much would this cost to run per month ? You could run all of this on a single server without a load balancer, which means it would be just $57.60/month, which with the Rackspace Developer Discount would reduce down to just $7.60/month.